KAP’s Robbie Katter and Shane Knuth have called the LNP a disgrace after they confirmed they will sell out North Queensland and pass the budget as is, without any negotiation. Shane Knuth said he was disgusted, but not surprised, with the government and LNP. “I wish I could say I was surprised, but I’m not,” Shane said. “I was excited because we had a real chance to make some change for North Queensland, but we needed support from either the government or LNP to make it happen, and neither of them would step up to the plate. They should hang their heads in shame,” Shane said. Robbie said he was shocked the major parties wouldn’t consider KAP’s requests. “They’re quite happy to throw billions of dollars at a Brisbane rail project so city people can get home from work earlier, but won’t commit to something as critical as reducing unemployment in the North. At least we in North Queensland know exactly where we stand with the government and LNP: and that’s on the wrong side of the Brisbane border,” Robbie said. Robbie and Shane will vote against the budget unless the government accepts their basic requests – which could make an immediate difference to North Queensland. More jaundiced reporting from the ABC about Springvale Station west of Cooktown that the Queensland Environment Department bought for $7 million to prevent sediment runoff into the ocean. The only problem is that bogus data was used to base the purchase, when in fact the Government’s own previously published scientific data clearly showed Springvale Station was responsible for less than one per cent runoff into Princess Charlotte Bay. In what could be a storyline from the satirical TV series Yes Minister, the Queensland Government has gone to war with itself. The ABC has learned one Queensland Government department has lodged a legal objection to another department over a plan to mine a river on state-owned land. The Department of Environment and Heritage Protection is taking on the Department of Natural Resources and Mines in a stoush in the Land Court over Springvale Station on Cape York. The Queensland Government bought the massive cattle station for $7 million last year. The idea was to stop, or at least reduce, hundreds of thousands of tonnes of sediment from the property washing from the West Normanby River into the Great Barrier Reef. But it seems — in the best traditions of Yes Minister — the left hand did not know what the right hand was doing. At the same time the Environment Department was buying the property to prevent damaging sediment flowing down the river, the Natural Resources Department was considering an application to mine the river at Springvale Station for gold and tin ore.
Now the case is before the Queensland Land Court. In its objection, the Environment Department argues “the public right and interest will be prejudiced by the proposed mining activity as it will directly and negatively impact the biodiversity values for which the property was acquired”. It says research suggests that “Springvale Station is the source of approximately 460,000 tonnes of sediment runoff every year, which is around 40 per cent of all gully erosion-derived sediment in the Normanby River catchment”. The West Normanby River joins the eastern branch of the river before draining into Princess Charlotte Bay and the Great Barrier Reef Marine Park. “The proposed mining activity will likely further destabilise the alluvial and colluvial soils of the West Normanby River and increase soil erosion and sediment loss,” the Environment Department said in its objection. The department also warns sedimentation blocks light for coral, smothers marine organisms and reduces coral and seagrass growth. 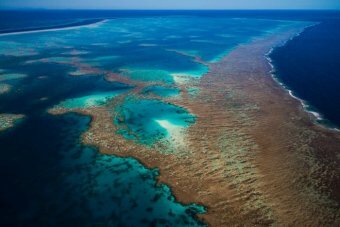 It states the northern section of the reef has been significantly affected by coral bleaching, with “high levels of coral mortality”. “For those corals to have the best chance of recovery, the water quality needs to be as good as possible,” the Environment Department wrote. The State Government has already begun removing cattle from Springvale Station in a bid to reduce sediment run-off. The Environment Department said it would invest a substantial amount of public money for conservation work on the property to further reduce run-off, with the price tag set at $30,000 a hectare. The department also said the property was home to endangered or vulnerable flora and fauna species, including the northern quoll, red goshawk, brown antelope orchid and spectacled flying fox. In a statement to the ABC, the Environment Department said it was the Government’s “intention that Springvale Station be declared a nature refuge”. But it said such a declaration would “not necessarily preclude the commencement of activities proposed under the mining lease application”. A spokesman for the Land Court said the objection to the proposed mine would be heard in August. Aboriginal cultural history did not begin until the end of 1945. Prior to the end of WWII indigenous inhabitants of Australia faced a grim future with Japanese imperial forces on our door step and the German army taking over Europe. It took the US Navy to stem the Japanese tide at the Battle of the Coral Sea in 1942 otherwise it would have been all over for our languishing black population. Do indigenous agitators think the Japs would have spared their forefathers if they started their mainland push southwards from Darwin or Cairns? The Aborigines would have been exterminated to a man, but thanks to the heroic Australian army they held off the pagan invaders at Kokoda. Thankfully there was a scattering of indigenous soldiers in the Australian forces who fought just as hard alongside the white troops and their efforts have been formally recognised. Violent demonstrations in Sydney about ‘invasion day’ being held on January 26 to commemorate the 1788 arrival of the first fleet have fallen on the deaf ears of mainstream Australia and repulsed while the unwashed, dole collecting, pinko rent-a-crowd clashed with police. National conscription has again been mooted by One Nation and polling has shown it will be accepted by the rank and file population. These brain-dead, university indoctrinated Bolsheviks need cleaning out just like the second generation of left-leaning university lecturers and the black militia that have infiltrated the so-called halls of secondary education. The army needs beefing up, most likely with the aid of a battalion of US Marines who could assist our hopeless Generals with discipline by kicking out the gay brigade and women from front line troops. Then our military would easily accommodate the hordes of 17 to 24 year olds sucking off the social security teat and show them there is more to life than rallying against and bludging off normal people who really run the country. US President Donald Trump has started to drain the swamp. Australia needs to drain the swamp and flush out the malcontents as soon as possible. Trump has started with the disinfectant in the US to flush out the same mob from their once-esteemed campuses and to ‘drain the swamp’ a process we should follow as soon as possible, that is when we put the broom through the limp-wristed, politically correct bureaucracy that infests Canberra. All jobs for the boys in the bureaucracy and judiciary should be declared vacant by the militarist Governor General from June 30, 2017 and then re-employ half the number who sign declarations of non-membership of trade unions, political parties and the Lodge. Turnbull’s ever- diminishing ‘ruling elite’ and Shorten’s mishmash of miscreants should end up in the mop bucket along with this third generation of bureaucratic malcontents who with the aid of their ideological masters have pushed Australia to a standstill. Australians must thumb their noses at the international ruling elite whose designs of a one world government will stop with Trump. Unfortunately we do not yet have a political messiah emerging from the ranks but when the going gets even tougher, the Australian camaraderie historically, will shine through. No corporate party hacks will be tolerated and in reality it is not a job for a woman. May God help this country for right now there is nobody else!